By Tom McParland | March 1, 2014 at 12:00a.m. Increased shale activity has led to the development of new hotel projects to meet the need of out-of-state workers. This one, at Tiffany South in Boardman, is near three other motels. The region’s shale-drilling boom has brought with it an influx of out-of-state workers to eastern Ohio. And they, in turn, have brought both opportunities and challenges to commercial and residential housing markets that are adapting to increased demand. In Columbiana County, the oil and gas boom has contributed to the increased inquiries and home sales. Some of those homes have gone to drilling-company employees looking for permanent housing in a new area. But many have gone to local workers in ancillary industries, who have seen an increase in business from companies in need of infrastructure to support their operation, said Marlin Palich, general manager at GM Northwood. “In 35 years, this is one of the great excitements,” he said. In Guernsey County, housing inventory is down by more than 50 percent, said Shawn Bennett, field manager for Energy InDepth Ohio. But the most-affected sectors of the housing market are those that offer shorter-term housing options to workers moving here temporarily. Cookie Bell, vice president of B&I Management, has noticed an uptick of residents at the Central Park West and Le Chateau apartment complexes in Austintown. Those facilities have become more flexible, offering more month-to-month leases and furnished apartments for transient workers. But the oil-and-gas boom also has its costs. In June 2013, the Ohio Housing Finance Agency issued a series of reports examining the effect of the boom on areas seeing the greatest activity. The studies found that shale development has created a shortage of rental homes in some rural parts of the state, squeezing low- and moderate-income families for housing options. Researchers looked at Carroll County, the region’s most-active drilling area. According to statistics from the Ohio Department of Natural Resources, there have been 376 drilling permits issued and 142 wells drilled in the county. The research data showed an influx of workers, combined with limited affordable housing availability and housing per diems, caused market prices to soar and strained the existing housing infrastructure in the county. “As this industry expands in eastern Ohio, we anticipate that additional housing shortages will take place throughout the region, with smaller communities being affected first,” Robin Stewart, project manager at Ohio University’s School of Leadership and Public Affairs, said in a statement. Communities in this area are expected to feel less of an impact than places like the small city of Williston, N.D., where drilling has caused the population to double since 2010. According to an Associated Press report last month, the average rent there has skyrocketed to $2,394 a month and now far exceeds the average rent in New York and Los Angeles. Still, Barbara Truman, a real-estate agent at Cutler Real Estate in Carrollton, has seen rental prices in Carroll County climb significantly over the past two years. She said that monthly rent in Carroll County has jumped from about $500 a couple years ago to between $1,100 and $1,200 now. The rental market, she said, has been “extremely busy” with temporary workers looking to rent properties. Most of the workers she sees are from out of state, and they tend to gravitate toward duplexes, apartments and homes that three or four people can share. Though there are some families, most are young men who move on to other areas relatively quickly. Truman said that many of the leases are shortened to six months to accommodate high turnover. Home prices have been on the rise, too. But most homes are purchased by full-time, local residents. Truman said her agency still has sold homes to workers, but like the rental properties, they aren’t occupied for long before one group of tenants moves out and another moves in. “Some of the homes, we’ve sold twice already because they’re in there for a short period of time, and then they move to another state,” she said. With properties rented on a regular basis, some transient workers gravitate toward campgrounds that have utilities and hookups for trailers, which offer the workers more flexibility to move with their families, Truman said. The spike in temporary housing demand has spurred the construction of two new hotels in Carrollton. 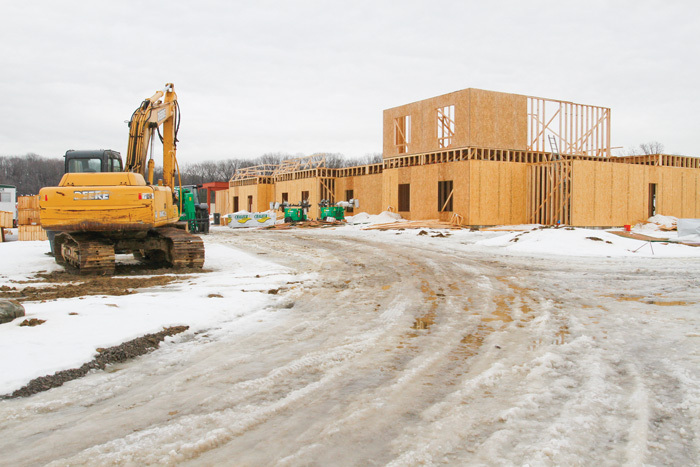 The shale- drilling boom there is being credited for the construction of two new hotels that will bring 179 rooms, intended primarily for industry workers, to Carrollton’s main strip of state Route 43. 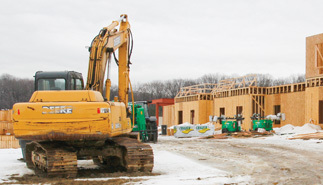 The new 79-room Microtel Inn & Suites and 100-room Candlewood Suites are going up about a mile apart from each other. The hotels will offer pools, fitness facilities and other amenities and will charge on a per-night basis, said Amy Rutledge, executive director of the Carroll County Convention & Visitors Bureau. Construction on the Microtel hotel began in late September, and it is on track for a spring opening. Candlewood Suites got a later start and is expected to open late this summer. Rutledge said similar projects are rumored to be in the works in Stark County and other neighboring areas, but nothing is certain yet. While some communities are responding to the demand, places such as Youngstown and Canton already had a solid infrastructure in place before the shale boom hit. Canton, Truman said, is popular among older company higher-ups who enjoy its more diverse social and retail offerings and don’t mind commuting to drilling sites. Kaylou King, director of sales and marketing at the Boardman Holiday Inn, said the hotel started noticing an increase in business from oil and gas workers about a year and a half ago. “We’re definitely seeing, overall, more of an influx from drilling,” she said. First, it was teams of five to 10 land surveyors, who would stay for a month or two. Now those groups have given way to teams of drillers and pipeline workers, who stay from two to three months on average, she said. “We pretty much have someone from shale drilling at the property at all times,” said Mike Naffah, who operates hotels in Canfield and Lisbon. He said business has increased “substantially” at the Hampton Inn and Suites in Mahoning County and the Days Inn in Columbiana County, since leasing and land men started checking in about four years ago. At that time, there were plenty of hotels to accommodate an influx of workers, but the demand still created a buzz among hotel owners. He said an oil and gas representative from the state met with the hotel association to warn owners against building new hotels, since the bulk of incoming workers would move on after well construction and drilling was complete. “They were basically just looking out for our best interests,” he said. Areas north of the drilling epicenter don’t have the high-traffic problems seen in the south, and they provide more access to retail centers. There is a commute to drilling sites, but Naffah said most workers appreciate the extra time in the car. “A lot of them don’t mind the drive because its a little relaxation for them, whether it’s before or after work,” he said. December 22, 2011 12:15 a.m.
April 20, 2014 12:10 a.m.